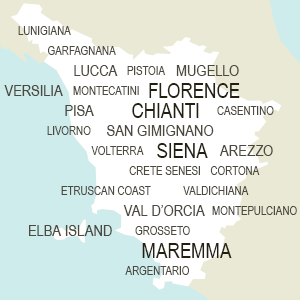 The Etruscan Coast is referred to both the coastline and the backcountry in the province of Livorno, which corresponds more or less to that area defined Maremma livornese. The origin of this denomination is quite obvious, the Etruscan civilization is in fact the leitmotif of all the area, that still preserve wonderful remains of its amazing past. Thanks to its cultural heritage, as well as the beautiful long beaches, the rocky inlets with clear waters and the bare but fascinating nature typical of the Maremma zone, all those locations have soon become very popular tourist destinations. Even if the Etruscan Coast is referred to a all municipalities of the province of Livorno (islands excluded), the archaeological remains are mainly located in Populonia and the Gulf of Baratti. Populonia, situated just over top of the Baratti bay, deserves a particular note especially for the nice and small historical centre, still showing some Etruscan archaeological remains, but the actual jewel of the Coast is Baratti. There, it’s still possible to visit (according to the seasonal timetables - which we strongly suggest to consult in advance) the ancient necropolis, today part of the Archeological Park of Baratti and Populonia, a real open-air museum not to miss out. Recently, other surprising remains of this civilization (considered one of the most important Etruscan settlement ever, whose main activity was iron processing, to be more precise) have been found along all the gulf coast, but unfortunately the archaeological works have been started out a long time ago and still not finished up. The Etruscan Coast is very renowned not only for its cultural heritage, but also for the wonderful beaches, the typical nature of the Maremma area, the services offered: all those aspects have contributed to make this location a very popular sea attraction. Among all places offering clear waters and refreshing pinewoods against the sticky, hot Summer, Rosignano Solvay deserves a particular mention for its white beaches. This resort actually recalls Caribbean, since the sand, almost blinding, creates a wonderful play of the light with waters.